Now here is one of those “heads up” which everyone will nod in agreement but instantly forget. This is the workshop at the bottom of a ginnel off Siverwood Avenue, but is also visible from Barlow Moor Road. From at least the 1960s it was a lock up garage, which when I took the picture was called Kentoms. But there will be people who will remember the previous owners, perhaps right back to when it became a workshop. In 2009 these were Ken and Tom, and Andy Holland has promised to tell me more about buildings from 1903. Wandering back down to the site last week I noticed that it is being transformed, into what I don’t know. I checked the Planning Portal but could only find a reference to the property dating back to 2009. It looks to be one of remaining coach houses of which there are a few dotted around, but my problem is that there does not seem to be any large houses in the immediate vicinity which might have owned the building. The nearest grand house was on the opposite side of the road roughly where Needham Avenue runs out into the Post Office car park. This property was there by the early 19th century and has quite a history. This was Oak Bank and was home in its time to the wealthy Morton family and later still the Cope’s who ran a chain of wine shops and drinking establishments in Manchester. It stood in its own grounds which ran along Barlow Moor Road as far as Sandy Lane, and was bounded by what are now Zetland, Corkland and Wilbraham Roads. By 1894 the estate had shrunk too little more than a pocket hemmed in by the houses on Corkland Road, Wilbraham Road and Maple Avenue and while its garden still extended west to Barlow Moor Road this too would be surrendered to housing by the beginning of the 20th century. Today all that is left is a stone gate post with the name of the house and a bit of the old wall. All of which means I gone looking elsewhere, and there is a candidate, although I suspect it was less a coach house and more a barn which was part of Clough Farm exactly where the present mystery building stands. In 1845 this was the home and farm of Margaret Taylor who rented 10 acres of land which stood directly to the west of our building and down to Barlow Moor Road and High Lane. 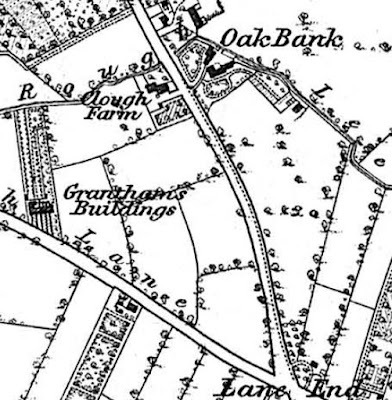 She farmed a mix of arable, clover and meadow land and looking at the 1853 OS map, the footprint of the buildings includes part of a structure resembling the garage. Added to which the tithe schedule for 1845 records she occupied and paid rates and rents on “Home buildings, yard and garden”. Now if that is the case our building is much older than I had thought. Alas the present development looks to have retained only the shape of the old building. The historic external brick work is missing but may be replaced, and its future use is unclear. Next; Tyfords the Grocers, Andy Holland and heap more on that place.